Panzerfeldhaubitze (Armored Field Howitzer) 18M auf Geschutzwagen (Self-Propelled Artillery) III/IV (Sf) "Hummel" (Bumble Bee) SdKfz 165 at United States Army Ordnance Museum after World War II. This Hummel was one of 118 sent to France to oppose the Normandy landings. Note the armor plate covering the side exhaust grilles and the added forward armored compartment for the driver and radio operator; this indicates a late model Hummel from late 1944. It was captured by the United States and sent to Aberdeen. Left in the open air, it was rusting away for twenty years until it was traded in the 1960s to the Wehrtechnische Studiensammlung (Defense Technical Study Collection), or WTS, in Koblenz, Germany, which restored it to running condition. The "Hummel" was designed in 1942 as the fast-moving panzer divisions had no artillery component that could keep up; most of the Wehrmacht's artillery in World War II was horse-drawn. It mounted the 150mm (5.9 inch) sFH 18 L/30 howitzer with a range of 14,490 yards (13.25 kilometers) for indirect fire support. The Geschutzwagen was a hybrid chassis that used the suspension of the Panzer IV and the transmission of the Panzer III. The Hummel made its combat debut at the Battle of Kursk. A battery of six Hummels would normally be attached to a panzer division. 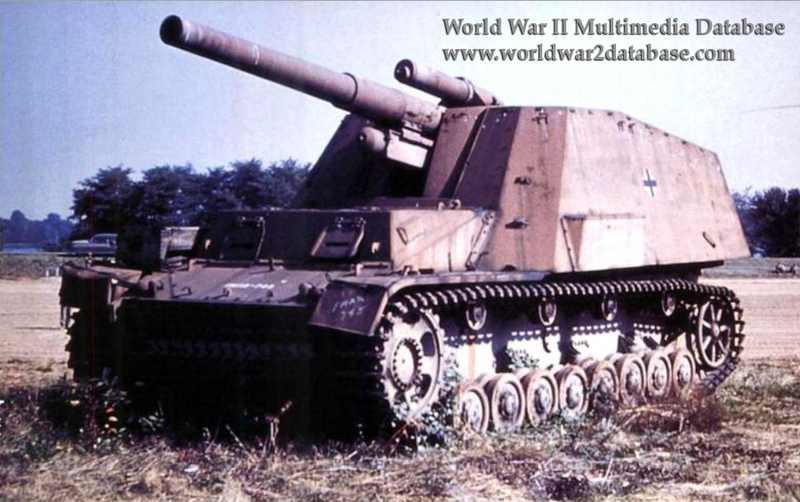 An additional vehicle, a Munitionstrager (ammunition carrier) Hummel, would carry additional ammunition as the Hummels could only carry eighteen rounds. The Munitionstrager Hummel could be converted to a working gun carriage in the field if needed. Reichskanzler Adolf Hitler opposed the "Bumble Bee" name and ordered that designation discontinued because he felt it did not reflect well on a fighting vehicle. Also using the Geschutzwagen chassis was the tank destroyer "Naschorn" (Rhinoceros) which mounted an 88mm (3.46 inch) gun.